Animal-assisted therapy has been shown to significantly reduce pain, anxiety, depression and fatigue. At MidHudson Regional Hospital in Poughkeepsie, an exceptional patient experience provided by caring staff is hardly a surprise. Perhaps more surprising is that certain care-team members make their rounds on four legs. 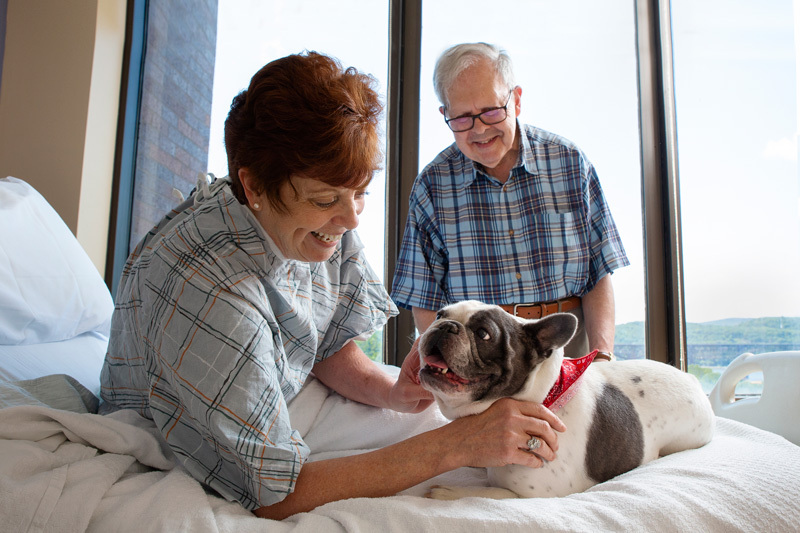 A member of the Westchester Medical Center Health Network (WMCHealth), MidHudson Regional Hospital has a vibrant pet-therapy program that engages and comforts patients as they recover. Pet therapy programs are also offered at Westchester Medical Center, the flagship of WMCHealth in Valhalla, as well as Maria Fareri Children’s Hospital in Valhalla and HealthAlliance Hospitals in Kingston. The term “pet therapy” includes animal- assisted therapy and other activities to help people recover from, or better cope with, health problems, such as heart disease, cancer and mental-health disorders. Additionally, animal-assisted therapy has been shown to significantly reduce pain, anxiety, depression and fatigue. MidHudson Regional Hospital’s therapy dogs are trained via its partner, The Good Dog Foundation. Founded in 1998, Good Dog’s mission is to ease human suffering and promote recovery from trauma and stress using animal-assisted therapy services provided through professionally trained and supervised volunteer teams. These volunteer teams each consist of a human handler and therapy dog. Good Dog provides training and certification to dogs who meet certain minimum training criteria. Learn more about two of the certified volunteer teams who have made a difference in the lives of hundreds of patients at MidHudson Regional Hospital. After a review of basic obedience skills, the major part of the training was to get Wilbur and his eight classmates accustomed to the unfamiliar sights, sounds and situations they might encounter in a hospital setting, such as wheelchairs and mechanized beds. “Wilbur was kind of scared of crutches, but we worked on that,” recalls Todoroff. Once the seven-week program was complete, Todoroff reached out to local hospitals and connected with MidHudson Regional Hospital. After completing orientation, Wilbur and Todoroff have been providing comfort and companionship to recovering patients ever since. 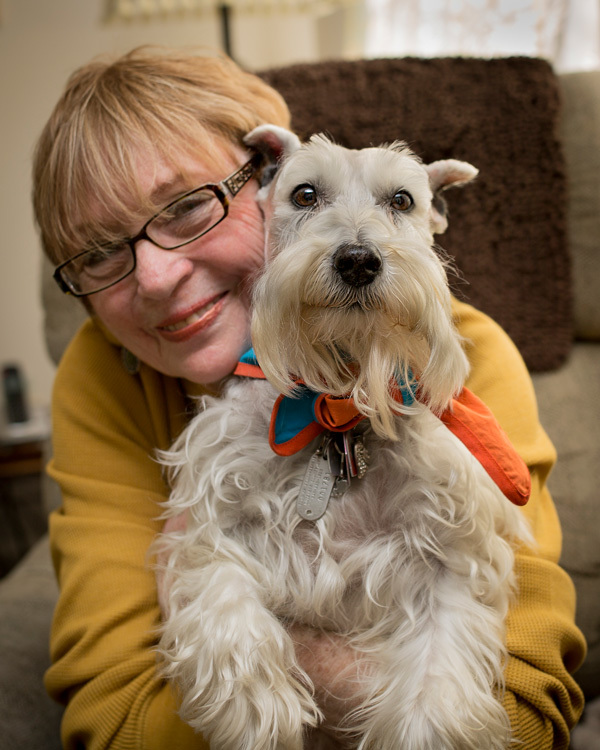 Judith Clemente’s beloved schnauzer, Ava, provided therapy in special-needs settings, often with children on the autism spectrum. Ava’s service included therapy in special-needs settings — such as the Martha Lawrence School, a MidHudson Regional Hospital Early Education Center — often with children on the autism spectrum. She’d do tricks for treats with children, and their interaction would encourage children to speak and even write about their experiences with her. Once, when Clemente and Ava were visiting hospital pediatrics, there was an infant who needed testing done on an empty stomach. Desperate to be breastfed, the baby cried whenever she looked at her mother. Ava came to the rescue! As soon as Ava and the baby started to make eye contact, Ava calmed her down when no one else could. Forbes always encourages volunteer applicants to get involved with the pet-therapy program, both human and canine. “Volunteering in general is a great way to give back to the community. We have some volunteers who have been doing this more than 40 years,” she notes. To explore volunteer opportunities at MidHudson Regional Hospital, visit www.midhudsonregional.org/volunteer. How can I keep my home a safe place this time of year?